Marketing: Can a Bank modernize it's image without losing its customers? Can a bank modernize its image towards y-generation customers, without alienating their older and much richer customers? For young people, I imagine working in a bank marketing team can sometimes be frustrating. To encourage people to put their money in them, banks need to have a solid and reliable, if not staid image. As a result, some of the more modern ideas, like holding ice skating bar parties and massive club events with a popular DJ may just be out of their reach. More recently though, some banks have decided to take the plunge into something more contemporarily modern. 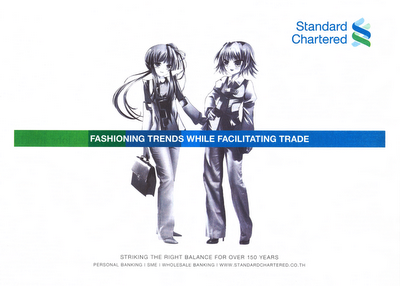 For the past few weeks, Standard Chartered has run newspaper ads in the business section, using anime styled characters. What caught me off guard was that Standard Chartered was by no means one of the more maverick banks. Like all established banks, it’s old, has a long history, offers low interest savings rates and generally is seen to be strong and solid. The anime poster changes the equation. Although the caption is a bit cheesy, given the serious nature of the caption versus the unserious nature of Japanese cartoon characters, it does make the bank feel slightly more up-to-date, as if its trying to target generation Y. A bank in Thailand called Kasikorn Bank tried to modernize its image by using a Superhero theme as the major part of its marketing campaign. 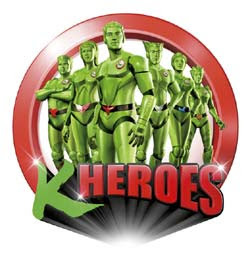 It featured five bank tellers, who would transform into green-coloured superheroes and heroines, who would then assist customers in growing their money and helping them to save. It was a complete turn around from previous campaigns. I had mixed feelings about it. Even though I felt it was strange and out of place for a bank’s image, I did appreciate their efforts to try to appeal to the younger customer, and to make the bank look cool. About a year into the campaign, the heroes disappeared and a more traditional marketing campaign was readopted. I actually asked several employees what happened. They all answered the same: the heroes campaign looked too childish and didn’t help improve the bank’s credibility. The dilemma here is that in the long term, banks need to attract the younger generation to save at their institutions. They can’t afford to do so at the determent of their older customers, who are much richer than their younger counterparts. A good modernizing campaign will need to segment the market carefully and target these different groups individually. Can a bank look cool to the younger generation, yet serious to the older generation at the same time? 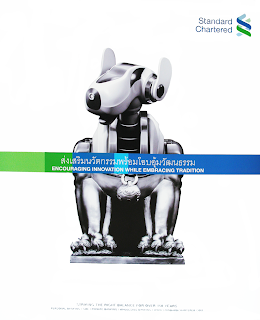 The problem with the Kasikorn Bank campaign was that the Heroes imagery was a mass market campaign, which might have appealed to the younger generation but completely repelled the richer and older clients. Standard Chartered’s technique is more subtle, but still fairly mass market. It hasn’t adopted the anime idea as the central theme, but just as parts-to-a-whole – other similar posters feature, for example, a Sony Aibo dog as the top half of the poster, with a traditional Chinese lion on the bottom. The beauty here is that if a client finds Japanese cartoon characters repulsive, another poster is there which offers a different, playful but more serious image. As a result, they engaged in mass segmentation quite effectively. It’s an interesting step, and I give them kudos for it. What do you think? Does Standard Charterer’s campaign work? Does the segmentation occur in this way? Talk back to me. Karn Bulsuk: Full Speed Ahead: Marketing: Can a Bank modernize it's image without losing its customers?